I remember when I was a kid I had a friend whose mom was a stay-at-home mom. She made these big dinners each night and they had dessert every night. No matter what. If you ate your dinner you got to have dessert. I loved eating dinner at her house. I wanted to be like that when I grew up. I wanted to always make a special treat for my family. Food is love in my house. I love making dinner for my family and I love making dessert. But realistically, I do not get to do it every night. People think because I work from home that I have more time to focus on things like that. But in fact, I am always driving someone somewhere. My kids have after school sports, games and practices, horseback riding, jobs to get to, and the list goes on. I am happy if I can put together dinner most nights and that the kids do not eat dinner from a can every single night. But I still want my kids to have that memory. For me, I tend to use desserts as a way of getting the kids in the kitchen with me. I can spend time with them and we all have fun. I can even have my grandson in the kitchen with the older girls, well my 8 and 13 year old. Kids in the kitchen is a great way for families to connect when they have busy schedules. That is another reason I want something easy so that the kids can help and we all have fun. 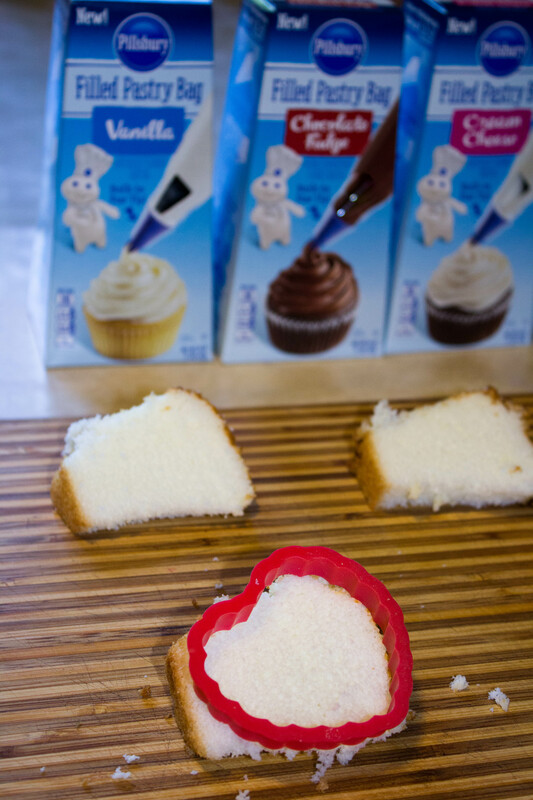 Cut pieces of Angel Food cake into slices, and then cut it with the heart cookie cutter. Add a layer of frosting to the piece of Angel Food cake using the Pastry Bag. This is the first layer of your dessert. 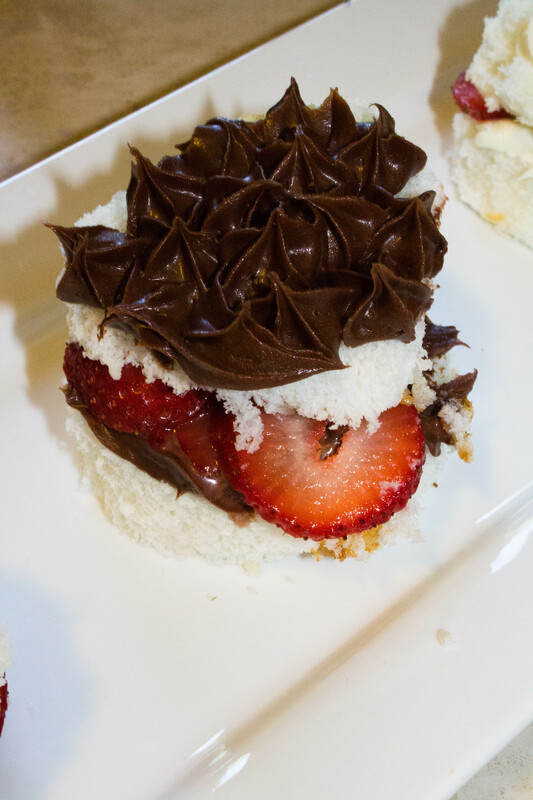 Add layers of strawberries on top of the frosting. Add the top layer of cake and add frosting. This is the layer you will see, so make it pretty. The reason this recipe is perfect for anyone is because it is so easy. 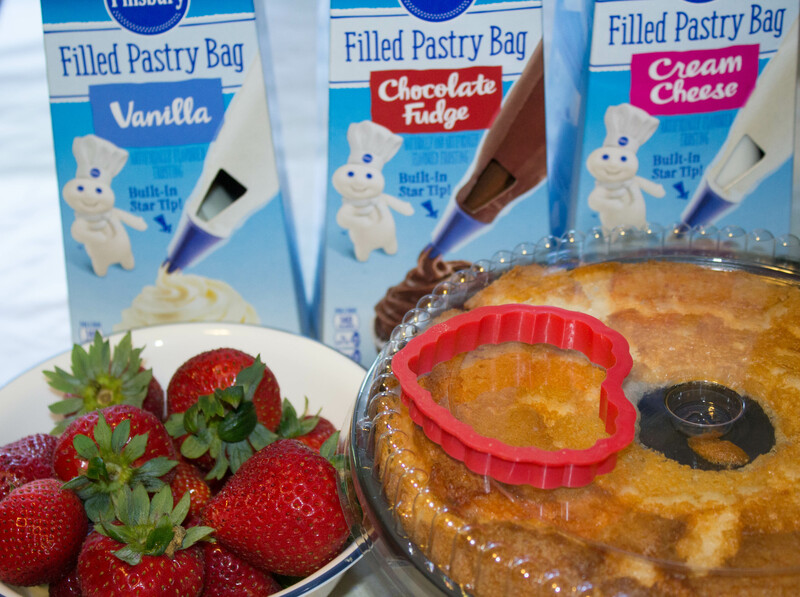 The new Pillsbury™ Filled Pastry Bags come in 3 delicious flavors, Vanilla, Chocolate Fudge, and Cream Cheese. With the easy to use pre-filled Pastry Bags, you can decorate cookies and cakes like a pro, even the kids can do it. Using the built-in star tip, you can make stars, rosettes, and waves. Want to know how to use the pastry bags? Simply push the frosting towards the star tip and twist the top of the pastry bag. 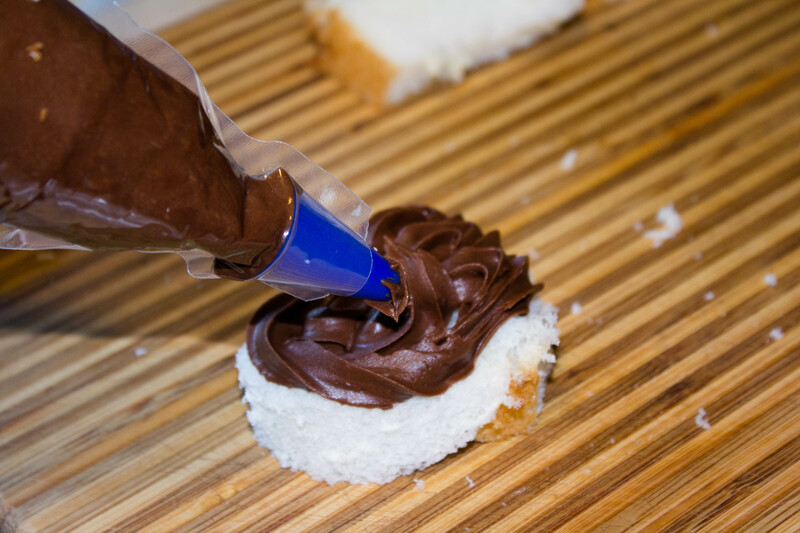 This keeps all the frosting at the tip and it makes creating designs easier. Remove the plastic cover from the star tip by tearing the perforation. Then simply start frosting your dessert. It is truly that easy. 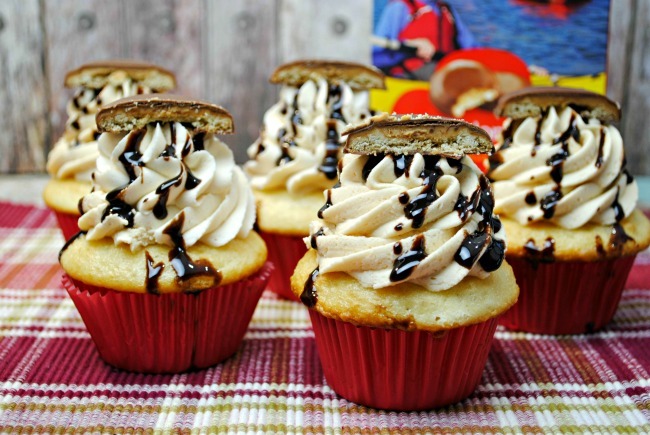 Even though I worked in a bakery for years, there are many times when I am making cupcakes that I simply do not want to go through the hassle of digging out the pastry bags, finding the tips, filling the pastry bags and then frosting the cakes. These Pastry Bags can take all of the challenge out of decorating cupcakes and will make anyone look like they have professional, store bought cupcakes, with all the delicious flavor of homemade. 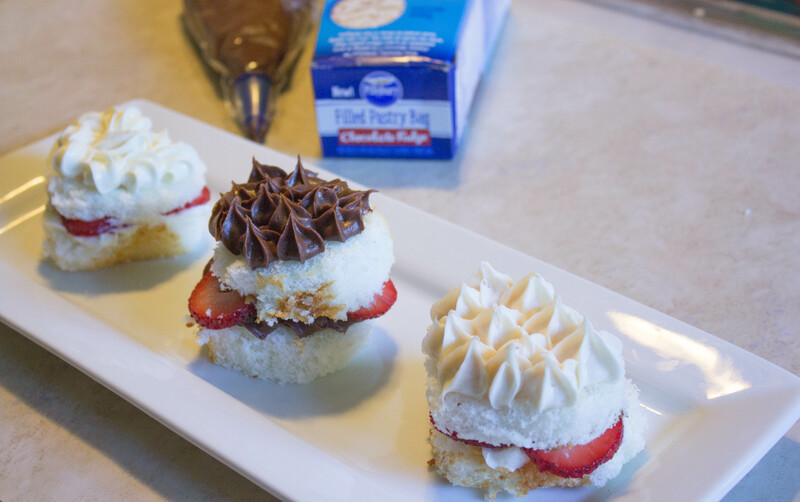 With frosting in all the major flavors, you can use Pillsbury Filled Pastry Bags for every occasion. Get your Giant Food Store coupon for Pillsbury Pastry Bag Frosting now.